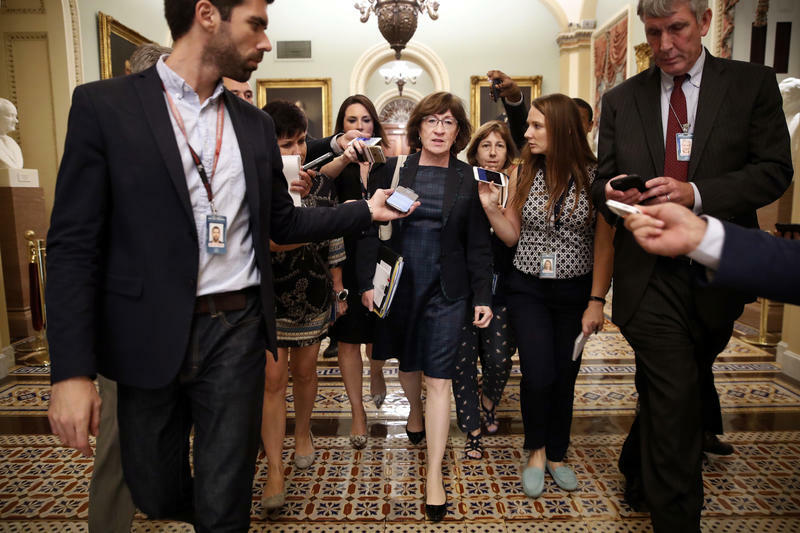 Sen. Susan Collins, R-Maine, is surrounded by reporters asking her questions about Supreme Court nominee Brett Kavanaugh, Wednesday, Sept. 26, 2018, on Capitol Hill in Washington. I am pleased to hear Mark Judge has indicated he would cooperate with investigators. Collins also tweeted that she is pleased to hear Mark Judge will cooperate with investigators. Ford has said Judge was present with Kavanaugh during the sexual assault she described in her testimony Thursday, in front of the Judiciary Committee. The following originally posted 7:26 a.m.
Thursday’s explosive Senate hearing with Supreme Court nominee Brett Kavanaugh and Professor Christine Blasey Ford, the woman who accused him of sexually assaulting her in the ’80s, is over. Now the spotlight is shifting once again to Republican U.S. Sen. Susan Collins of Maine. Collins is among a handful of centrist Republicans who could be a critical swing vote in Kavanaugh’s lifetime confirmation. Maine Public political correspondent Steve Mistler spoke with Morning Edition host Jennifer Mitchell about Collins’ reaction to the hearing and gave some context for her upcoming decision. Mitchell: There was a rumor that some Senate Republicans might have met last night after the proceedings and Collins might have been part of that. Has she said anything since Judge Kavanaugh left the building last night, and do we have any sense of whether yesterday’s testimony has swayed her one way or the other? Mistler: We really don’t. The only thing we’ve heard are reports from reporters in the hallway that observed her, Arizona Republican Sen. Jeff Flake who’s also on the Judiciary Committee, Alaska Sen. Lisa Murkowski and Democratic Sen. Joe Manchin of West Virginia basically huddling in Collins’ congressional hideaway immediately after the conclusion of the hearing. Collins, for what it’s worth, viewed the hearing from that hideaway all day yesterday. I was in constant contact with her spokesperson, but they really didn’t have anything to say and I do suspect we’ll hear something imminently, because the Judiciary Committee meets at 9:30 a.m. for what is supposed to be a scheduled vote on Kavanaugh’s confirmation. So we really don’t know which way she’s leaning on this vote yet, but yesterday we heard some detail, we saw some passionate, emotional responses and maybe even some outrage from the judge. Was there anything that we saw that might weigh heavily on her decision? She has a lot to process, as do a lot of the people who watched that hearing. It was really something that few will forget. It was this mix of brutal emotions at times, pain and anguish, anger and sadness, all with the stomach-turning political gamesmanship by some of the senators on the Judiciary Committee. It was also really divided into two parts — you had, in the morning, Professor Christine Blasey Ford come in and seemingly relive the moment she says she was sexually assaulted by Kavanaugh on live television. It was just heart-wrenching testimony to observe. One wouldn’t assume that someone who has endured that would be a good witness, but she really was. And you could tell just by the reaction both on social media and otherwise that it affected a lot of people. I’m assuming it has affected some of the senators in the room, and potentially Collins. But then Kavanaugh came in in the afternoon and he just blew up, was just thundering, almost yelling, accusing Democrats of deploying what he called basically a secret weapon at the last moment and just assassinating his character. He was also emotional and sad in talking about how it affected his family. But he didn’t answer some of the questions, he was very evasive about whether or not he would agree to an FBI investigation, whether he would recommend one. It’s something Collins has been reluctant to push for that in the past, but it’s something that weighed heavily yesterday on the hearing. The other thing that was really interesting was that he at times seemed to nod to Collins without mentioning her by name. He twice mentioned a letter that was written by a woman from Yarmouth. It was a letter to the editor that appeared in The Kennebec Journal, basically vouching for his character, written by former GOP staffer Sarah Day and published before the sexual assault allegations. But even Kavanaugh seemed to acknowledge or at least was aware that Collins could very well hold his confirmation in her hands. So it’s a lifetime appointment. There’s a lot at stake here in Collins. Not surprisingly she’s been under a lot of pressure lately, lots of folks calling for her to go one way or the other. What’s at stake for her at the end of all this? There’s a lot on the line for Collins. I’m not sure if this is the toughest vote she’s had in her two-decade career in Congress, but it’s one everyone will remember, and the same goes for how she publicly rationalizes that vote. We don’t know she’s going to seek re-election in 2020. But this vote could certainly have electoral consequences if she does. Beyond that the vote could define her political legacy as well. This interview has been edited for clarity. An earlier version of this post incorrectly said that Kavanaugh omitted the identity of the writer of the Kennebec Journal letter to the editor.